This is a list of various videos which may be of interest to people just learning about the Zeitgeist Movement. Please make suggestions as you discover new, appropriate videos. 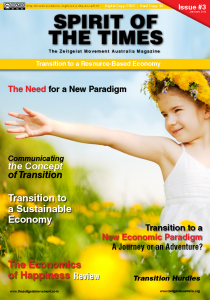 A great introduction to the Resource Based Economy (RBE) concept. HIGHLY RECOMMENDED. Zeitgeist : Moving Forward, by director Peter Joseph, is a feature length documentary work which presents a case for a transition out of the current socioeconomic monetary paradigm which governs the entire world society. This subject matter transcends the issues of cultural relativism and traditional ideology and moves to relate the core, empirical "life ground" attributes of human and social survival, extrapolating those immutable natural laws into a new sustainable social paradigm called a "Resource-Based Economy". This amazing presentation by Ben McLeish gives a brief explanation of the Zeitgeist Movement, a nice history of money and a reasonably detailed explanation of the current fiat based federal reserve monetary system (sometimes referred to as 'Money as Debt'). In part 3 it explains the technical ramifications of the system, including cyclical consumption, the contradiction of capitalism, competition, monopolies, and how the need for profit currently suppresses amazing technologies if they can't make money from it. Part 4 presents the concept of a Resource Based Economy, the core tenant of the Zeitgeist Movement and Venus Project. It is also available in Keynote (Apple Mac.. the primary format the presentation was created in), PDF (no animations), and Powerpoint (only basic animations) formats. This 2 hour documentary film describes the Money as Debt system that we currently live in, the corruption and priority of profit that it promotes, including a section on Economic Hitmen. It ends with a description of the Venus Project and the ideas of a Resource Based Economy, an entirely different way of thinking about resource usage and distribution that could replace the current monetary system. This is Recommended viewing viewing and was the film that started the Movement. If you are still interested in the Zeitgeist Movement then check out the main website and also the Orientation Guide Video [1hour37min] which explains the ideas in more detail. After watching the movie Zeitgeist Addendum you will likely have more questions than answers. The Orientation Presentation is a condensed version of the Activist Orienation guide (.pdf), and attempts to answer some of those questions with a more fact based, informative video. This is Required viewing viewing. A presentation by Rich Penney on the moral issues with a Free Market Economy. If you like this content you will likely also want to check out Michael Sandel: The Moral Limits of Markets. In this riveting and highly recommended TED talk by Dan Pink talks about the Surprising Science of Motivation. Explaining Intrinsic vs Extrinsic motivators and how the carrot and stick (reward and punishment) approach of the monetary system is only effective at motivating people for basic, repetitive tasks (i.e those easily automated). When it comes to tasks requiring creativity and 'thinking outside the box' then money is actually an impediment to motivation, whilst Intrinsic motivators (doing it because you want to and it's awesome) is much more effective. An AMAZING short film by Annie Leonard which explains the current consumerist based, cradle to grave system we live in which is destroying the environment and human well being. This is highly recommended and works well if shown to people before Zeitgeist Addendum, to get them into the right frame of mind. A short film that is a great mixture of The Crash Course style video explaining the debt of the economy plus the main tenants of the Zeitgeist Movement. An alternative great introduction to the Zeitgeist Movement for those who would be off put by the aggressive provoking nature of Zeitgeist Addendum. NOTE : You will need to go to the actual YouTube page to watch the full movie. William McDonough is a major advocate for changing the current cradle to grave system (extract, refine, process, use, throw away), to a more environmentally friendly solution, whereby the idea of recycling is taken to a whole new level. The idea of biodegradable food wrappers which people want you to throw on their lawn, or roofs with gardens on them to create food, promote bird habitats and filter water. William created the profound book 'Cradle to Cradle', and has started an amazing C2C movement. This video is one of the most important videos you will see because it will help you properly understand the sheer power of exponential growth. Do you understand exponential growth? Peak Oil? What about the formulae for the doubling time? The time it takes for something that is growing to double in size (70 divided by the % growth). e.g If our oil usage is increasing at 10% per year then we will be using double the amount of oil within only 10 years. If you want to understand issues with resource depletion, economics or energy then this is a required watch. The Empathic Civilization is the first book to explore how empathetic consciousness restructures the ways we organize our personal lives, approach knowledge, pursue science and technology, conduct commerce and governance, and orchestrate civil society. The development of this empathetic consciousness is essential to creating a future where we think and behave like the whole world matter. Jeremy Rifkin is president of the Foundation on Economic Trends and the author of seventeen bestselling books on the impact of scientific and technological changes on the economy, the workforce, society, and the environment. One of the most popular social thinkers of our time, Rifkin is the bestselling author of The European Dream, The Hydrogen Economy, The Age of Access, The Biotech Century, and The End of Work. Highly Recommended. This is a great video which explains the true meaning of 'Survival of the Fittest'. It also does a great job of explaining some of the issues between Tournament and Pair Bonding Species. It also gives clues into ways we can transition to a Resource Based Economy. "Testosterone isn't causing aggression; It's merely exaggerating the agression that is already present"
These resources are ones that are suggested.. but not required. An amazing explanation of what Innovation is, with an explanation of incremental improvement then radical evolution. Whilst the amazing cosmologist Carl Sagan never officially supported the Zeitgeist Movement, he died before it existed, this is a great compilation of his work and shows that he had some very insightful and very similar views of the world. Note : It helps to enable the subtitles. David talks about why the scientific method is so powerful. It creates explanations that are hard to vary, and that that is the key to good reasoning. A rather interesting talk that all religious people should listen to, even if the presentation is a little dry. Name : TED : Dan Ariely - Are we in control of our own decisions? Dan Ariely's talk about not being in control of our decisions and shows how everyday decisions can be so easily influenced. A great informative presentation about energy and renewables. Even if you think you know a lot about renewable energy you will likely still learn from this. A TED talk on how our pattern seeking minds are prone to self deception and are most likely why we have concepts of God or larger controllers and beings. Also goes into conspiracy theorists. Seth Godin argues the Internet has ended mass marketing and revived a human social unit from the distant past: tribes. Founded on shared ideas and values, tribes give ordinary people the power to lead and make big change. Enhanced by 'Word of Mouse' the Internet enables a whole new way of communicating. A TED talk about how play can foster creativity. Also lots of fun to watch the finger blaster bit. Gap minder is an amazing graphing tool for visualising statistics and Hans Rosling has a great way of using the information presented to show how the world really is. The economic imbalances between different countries and even in countries, not to mention the the changes over time. Sir Ken Robinson highlights how the current education system is based on a factory assembly line model and makes an entertaining and profoundly moving case for creating an education system that nurtures (rather than undermines) creativity. The 12 main rules about learning and the brain. By Dr John Medina. Very good for helping you learn more efficiently. For those not aware, the lectures are about the Human behaviour ,biology and neurobiology. They explain how the environment, genes, brain and hormones work to affect peoples environment. It explains everything from how individual neurons work through to how the brain creates small amounts of hormones which can have dramatic effects on people. How genes give people a propensity for a certain trait but most are only triggered under environmental conditions. It has a very important focus on aggression and explains how people can reduce violence by thinking of all of humanity as their family. If you aren't sure about human behaviour then these lectures are probably the best scientific explanation you'll come across. http://video.google.com/videoplay?docid=8036281975251919592 [30mins] -- A talk about about various parasites affect brain function, especially Toxoplasmosis's ability to change seemingly hardwired fears and turn them into rewards. Note: There's a LOT of content here. This DVD contains Zeitgeist Addendum, the Activist Orientation Presentation, Where are we going, Where are we now, and Social Pathology. All amazing talks/films by Peter Joseph which are Required viewing. in order to properly understand the Venus Project and Zeitgeist Movement. In order to view the DVD you will need to run the file via a torrent program (e.g uTorrent or Azureus), download the 4.4Gigabyte ISO file, then use a DVD burning program like Nero, .iso burner, Infrarecorder, or Toast Titanium. The main reason for this DVD so that you can give out copies to other people interested in the ZM who don't have a decent Internet connection. This is THE Zeitgeist Movement website. It contains a listing of other chapter sites, but you can click through to the main site with main mailing list (which you pretty much must to subscribe to), plus information resources. A great way of keeping in touch with the movement, Peter Joseph and Zeitgeist Movement organisers regularly answer questions give interviews or explain concepts. As of March 2010 there was over 50 hours of Blogtalk radio shows (over 700MB worth of downloads). Highly informative for anyone with questions. It's a good idea to put them on your MP3 player and listen to them on the way to work/school. Based on the book Future by Design, by Jacque Fresco, the documentary Directed and Narrated by William Gazecki is a great look into the ideas promoted by The Venus Project. It contains interviews, designs and ideas, and various footage. Highly recommended. This site contains a great listing of various Zeitgeist related resources including DVD torrents, and even links to the original presentation slides. A listing of all TED talks. About 540 worth in October 2009 and about 1,100 in Jan 2012. The website of the book Confessions of an Economic Hitman by John Perkins. Also available on Amazon, and YouTube. An interesting article which shows that things which become popular quickly generally become unpopular very quickly (like a sharply pointed bell curve). But the harder it is to understand or slower it takes to become popular then the less likely it is to disappear quickly. Hence why meme's can come and go very quickly. Tim O'Reilly, one of the great men in Open Source, talks amongst other things, about how we should be praising the Internet as an example of the Open Source methodology, rather than Linux. The code need not be GPL, but the architecture should be setup for collaboration. Thanks for putting all this stuff together on one site! No probs Lord Anthony, I find it useful hence I put it together. It looks like I might have to update it though, so if you (or anyone reading this) know of any good videos to add and which should be replaced then let me know!